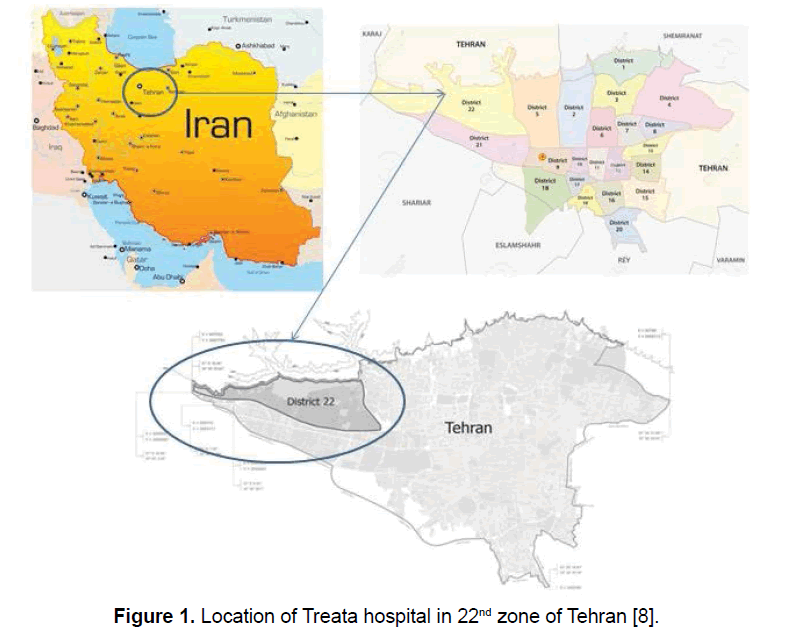 Citation: Rezaei A, Nakhaei J. Analysing Criteria to Locate Medical Centers in Approach to Passive Defense (Case Study:Treata Hospital in 22nd District of Tehran Municipality). Electronic J Biol, 13:3. Medical centers are kinds of centers, which significantly influence individual’s health, particularly on critical moments and in wars that have a vital importance. One of the main principals that are recently noticed in many countries, are the principals which have relation to passive defense and its importance on the criteria to locate the medical centers. This study analysis the principals and indicators of the criteria to locate the medical centers, which has the case study in Tehran municipality. The methods study is descriptive which the indicators are described, then they have analyzed and prioritized. Descriptive research includes a method that aims to describe the conditions or terms of the phenomena studied. Implementation of descriptive research can better understand the situation and assist the decision making process. By this methodology, samples of 30 volunteers who are professional in architecture have been attended to the research site. The principle of Collecting information and data is by presenting questionnaire beyond respective society and field data of case study. Ultimately, analyzing and prioritizing and ranking the indicators have been done by t- test and normality test. Participants and indicators of questionnaire have been evaluated and ranked by t-test and normality test. Therefore, some main indicators have been determined as an appropriate indicator in order to locate medical centers, which are Laws and policies, Capitation for facilities (electricity, water, gas, telephone) and ultimately passive defense. After assessing questionnaires which were distributed between professionals in architecture. Finally, assessing and prioritizing determined indicators in questionnaire, the first 3 prioritized indicators determined which are: Policies and lows of governments and authorities, Capitation for facilities (electricity, water, gas and telephone), Passive defense principles. Finally, SWOT matrix analysis the Treata site by passive defense indicators and some recommendations will be devoted in order to locate medical centers in approach to passive defense, which are mentioned at the end of the research. Locating medical centers; Passive defense; Tehran municipality. Determining health for individuals is one of the main human rights. so, one of the most effective spaces in the critical moments in order to decrease vulnerability which has a noticeable influence on humans health is hospitals and other medical centers. Urban growth in recent decades in our country has been in such a way that urban infrastructure needs of cities are not equipped with it. Tehran city as center of Tehran Province, as due to factors such as the migration of rural-urban, natural population growth, the excessive increase in population and physical growth of urban areas, faced with lack of planning. While the in terms of optimal distribution of space and place a fair arbiter for usage of public services especially clinical and health services quick and on time access is important to them, a proper atmosphere has not been considered. Usually establishment of any urban element in the position space-skeletal a special case of the city subjects to principles of Technique over construction work is e special in the case of observing the position of the functional efficiency and that element will be determined in the same place and otherwise might have problems in public services units' health and treatment . Meanwhile health services today are as one of the urban infrastructure in order to develop the areas and aimed at raising the level of health and increasing life-prolonging activity of individuals and forces and, finally prevention of disease outbreaks and timely treatment . In this regard, during the last two decades a lot of research to design optimal treatment centers, hospitals and clinics have been conducted . Therefore the main task of urban planners is to determine the optimum location of urban centers so that all residents have access to them easily. One of the main goals of the governments is to make people accessibility to medical centers remarkably easier that people could use these centers appropriately. Due to the fact that many countries are exposed to many threats (naturalartificial), (usual-unusual). Observance passive defense principals noticeably impact on Crisis management and identify social behavior. Therefore, locating these centers in approach to principals of passive defense is significantly important and many procedures should be devoted to the criteria to locate medical centers in approach to passive defense. In this research, firstly the most effective indicators of criteria to locate medical centers will be discussed and then by those, principals and indicators will be prioritized by field data (questionnaire), as a matter of fact, analysing them by t test and normality test. Ultimately, some principals will be presented in order to locate medical centers in approach to passive defense. Analysing criteria to locate medical centers in 22nd zone of Tehran municipality in approach to passive defense. 1. Determining indicators of criteria to locate medical centers. 2. Prioritizing effectiveness of each indicator in order to locate medical centers in approach to passive defense. 1. Hosseini in the research “original architectural monuments health requirements of passive defense in the second module of training managers Technical University of Medical Science offices across the country” has presented these points: He examines the causes of the earthquake as well as the principles of crisis management, points of interest in planning reached before the earthquake. Also, he has presented numerous principals of passive defense so that these guidelines have leaded him to specific principles of passive defense in building health centers, and providing guidelines and criteria . 2. Mahboobi in the research “locating and designing a comprehensive hospital in Tehran with passive defense approach” in his dissertation for a master degree (M.A), in the Islamic Azad university of Tehran, has presented these points: passive defense is one of the principals of architecture and designing. However, it hasn’t been noticed in many hospitals and medical centers in Iran. Specially, in critical moments or in the wars or in the earthquakes or in flood that the consumer of these centers will be significantly more than other centers. The conclusion which has been achieved from this research is as follows: determining the importance of educating passive defense for architectures and planners, privacy extraction passive defense architecture [5,6]. As it is obviously seen in the respective research and other research which have not mentioned here. There is no specific evidence that reveals there is a research about analysing criteria to locate medical center in approach to passive defense. Therefore, this research is going to represent a new sample to analysis medical centers. The population of the study and its volume estimate. The population of study is about 30 persons which is contained professionals in passive defense field, PhD and master students in architecture field and finally, the doctors of Treata hospital. The results of cluster analysis on health services, including hospitals and health centers, reveal that: the areas on the north, center and south of Tehran in 22nd and 21st and part of 4th zone of Tehran have the least availability to the medical centers. In other words, hospitals and medical centers are moderately in the central part of Tehran. Totally, availability to the medical centers services in central part of Tehran is more than other parts. North parts of Tehran, (except 3th zone), are moderately in a suitable situation. However, availability to the west part of Tehran (22nd zone) is not that much appropriate. Ultimately, 22nd zone of Tehran can be an appropriate case study for this researches in order to analysis the criteria to locate medical centers in approach to passive defense. Tehran enjoys a special position in terms of geographical location. Deployment on the southern slopes of the Alborz mountain range, rich water resources and it has brought mild weather conditions. Due to the location and site conditions for the establishment of Tehran's population, a central place to access and manage land at its disposal. Due to the geography of Iran and spatial distribution of population and settlement patterns, special and privileged position to make a good show. In 2001, professional doctors have established Sahand Medical Center. During the years, in 2004 and 2005, after increasing respective center activities, Constituencies have concluded that because of the numbers of consumers and extreme amount of activity, this center should be developed. Therefore gradually, the idea of establishing a hospital has been made. The first step to establish hospitals, an optimal site and principles. Constituencies considered economic conditions, the price of land, accessing to transport networks, distance from other medical centers, population density, etc. Finally, after eight months of study, district 22 chose. According to the following Figure 1, the location of 22th zone of Tehran is represented. Figure 1. Location of Treata hospital in 22nd zone of Tehran . Some of the main indicators which were moderately effective to locate medical centers are presented and analysed in order to investigate the coordination of the Treata hospital site to passive defense principles. Figure 2. Treata hospital residential area (Author harvest field). 1. From passive defense prospect, a congested and noisy area such as residential, educational area and shopping center can be harmful, due to inappropriate noises, and also in critical moments such as earthquakes, there is a possibility that other residential buildings collapse on the hospital. 2. From respective prospect, as it is vividly observed, there is no specific park o waste and vacant land near the Treata hospital, which is extremely dangerous and unsuitable in critical moments. Due to the fact that there is no area for Relief Camps and helicopter in order to service and help people. 3. From other prospect, residential and educational area next to the hospital can be suitable, due to the fact that it can services to many people specially inhabitants and students. 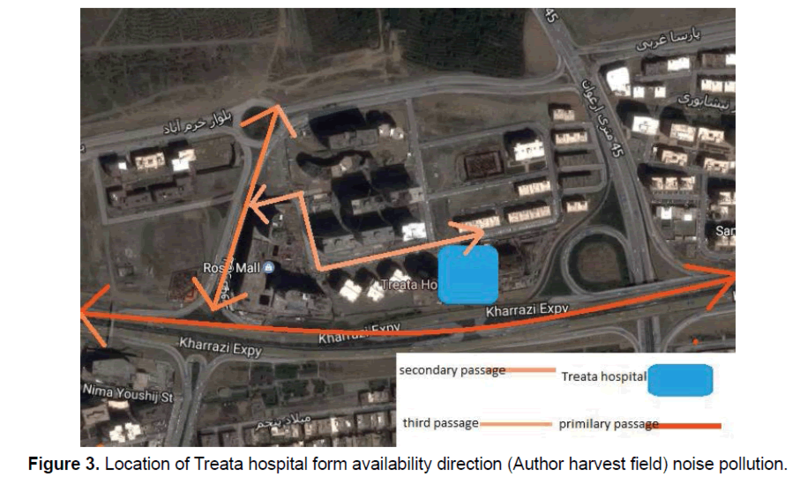 According to the following Figure 3, Treata hospital site is next to the Kharazi highway. Actually, it is located near primarily passage which is significantly appropriate from passive defense prospect. Due to easy and fast availability to the hospital, specifically in critical moments. Figure 3. Location of Treata hospital form availability direction (Author harvest field) noise pollution. 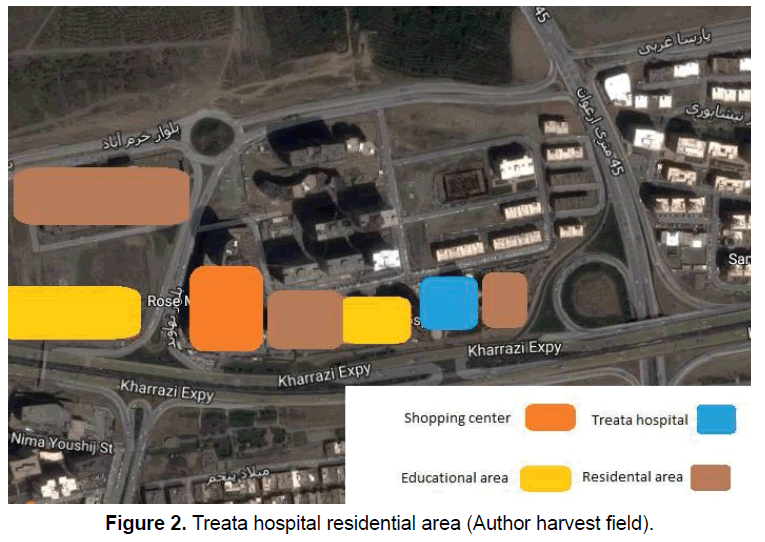 According to the following Figure 4, Treata hospital location (next to the Kharazi highway) is noticeably inappropriate, due to the noises and harms for the patients of the hospital, which is remarkably unsuitable from passive defense prospect. However, this issue can be significantly decreased or even solved easily by trees or retaining walls. Figure 4. Treata hospital noise pollution (Author harvest field). According to analysing of some the main indicators of Treata hospital location, this site location has got some indicators which are not coordinate with passive defense approach. Therefore, some solutions should be devoted in order to increase coordination of the respective site to passive defense principles. In this method the researcher to choose a "case" and it examines various aspects. This can be a single or a delimited system consists of various elements are interrelated. These include education can be a factor in the educational system, such as student, teacher, curriculum and so on. The overall goal of this method Detailed view "case" is under study and interpret observations of holistic perspective. The case study is more qualitative approach with an emphasis on processes and understands and interprets it done. Research using the case study method consists of four steps: the subject and the "on" (analysis unit), do field work (data collection), organize data and compiling reports. Interest in the case on a "case" is focused. But this may be one of several different people or events consist of various processes. In this case, it is essential that the components of the “unit of analysis” are sampled . Due to this point, usually coefficient ranges changes from zero (Disaffiliation) to +1 (complete affiliation). Coefficient ranges reveals that how much measure tools evaluate its stable measurement tool characteristics or features variable subjects and temporary. There are different kinds of ways in order to evaluate coefficient ranges of measure tools. Among them we can mention Cronbach's alpha, which are discussed in the following description of this method. Cronbach's alpha coefficients to assess the reliability of the questionnaire: This method is used for calculating the internal consistency of measurement tools such as questionnaires or tests that measure various attributes, in these tools, the answer to every question can adopt different values. Cronbach's alpha coefficient of variance for scores of each subgroup must first questionnaire (or under test) and calculated the total variance. The coefficient of zero indicates a lack of reliability and +1 indicates full trust reliability. Typically, doses higher than 0.6 for the coefficient of reliability can be confirmed (Table 1). Table 1. Result of Cronbach's alpha coefficients (Author analysis). According to the Table 1, since the amount of Cronbach's alpha coefficient of the questionnaire is greater than 0.6, so the question of the reliability of the questionnaire is quite appropriate level. Therefore, all questions reliability is acceptable. Table 2. Descriptive statistics of each question (Author analysis). The following Table 2 is for descriptive statistics questionnaire. The table statistics such as the number of minimum and maximum value and the average of each question. Table 3. Results of Kolmogorov-Smirnov test (Author analysis). H0 follow a normal distribution of observations. Due to the fact that significant levels of increased measures affecting locating medical centers-health is more than 0.05, Views normality assumption (null hypothesis) is not rejected. As a result, data for those variables are normal. But since the average effective measures to locate medical centers-health is normal, parametric test-sample and t-test will be used to evaluate and rank the questions (according to the Table 3). Test t (t-test) to measure the non-uniformity of the sample mean of the average community in the mode used, standard deviation is unknown. Since t distribution about small samples (n ≤ 30) adjusted by some degree of freedom, t-test can be used for very little tests. Also, t-test is functional when standard error of community (σ) is unknown and standard error of sample (s) is known. Average of sample population ( ). In this research (μ) is about 3, and the average of questions has been compared with this number. If the average of question becomes more than 3, the Significance level will be less than 0.05. Therefore, the effect of this question is more than average level and it can become more. And the following question could be selected for the exploratory factor analysis. Table 4. Results of Kolmogorov-Smirnov test (Author analysis). According to the Table 4, the questions which are shown in green are in good condition. Because not only the average difference is positive, but also the level of significance is less than 0.05. The amount of t-test for the questions which is green is positive and more than 1.96 and significance level is less than 0.05. As a result, these questions could be considered as an appropriate item. According to the Table 5 the highest rank is devoted to question number 1 and the lowest rank is devoted to the question number 10. Table 5. Results of the question ranking (Author analysis). Now observance of passive defense principles in the Treata site will be analyzed by SWOT method. so that by weaknesses , threats, Strengths and opportunities, some solutions and recommendations will be devoted in order to locate medical centers in approach to passive defense. There are a variety of solutions in order to convert qualitative to quantitative criteria. Therefore, the method is compatible and consistent with the subject matter, is SWOT analysis. In this type of analysis, internal and external factors are examined. Opportunities, threats and strengths and weaknesses of the matter is investigated and to deal with it the best strategy is developed. Accordingly, different strategies in the category of weaknesses and threats (WT), Strengths and threats (ST), weaknesses and opportunities (WO), Strengths and opportunities (SO) (Figure 5) . Figure 5. Nakhaei Bagherzade 2015 . After SWOT matrix, assessing matrix and strategic measures is formed. So, for internal and external factors evaluation matrix has formed and rated. Ultimately, the final score is obtained and due to that, the graph is drawn up. This section examines the strengths and weaknesses of internal factors which were collected by the expert’s comments and field data (Table 6). Table 6. Results of examines the strengths and weaknesses of internal factors. Due to the amount of sum total which is 2.41, it is concluded that in the internal factors section, weakness conquer strength. Table 7: Results of examines the strengths and weaknesses of external factors. Due to the amount of sum total which is 2.75, it is concluded that in the external factors section, opportunities conquer threats and have significantly more importance. Based on the results of the evaluation of internal and external factors, this sample can be devoted (Figure 6). Figure 6. 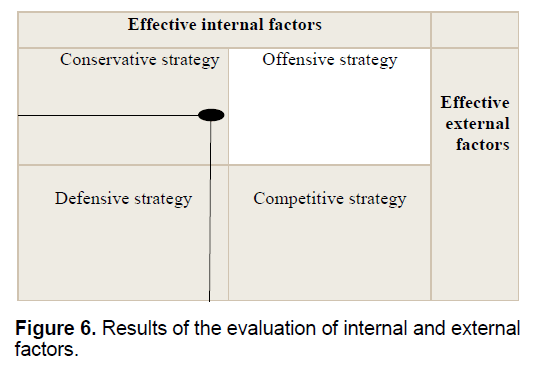 Results of the evaluation of internal and external factors. Since the passive defense professional’s opinion held the top spot treatment in order to locate the medical centers, therefore, the principals of passive defense is significantly vital to locate medical center. As it is vividly observed, due to analysis of location of Treata hospital site in approach to passive defense principals, it is not coordinate with respective principals. So, some main solutions should represent in order to decrease the negative points of site location and using the positive points of this center in critical moments. The respective strategy has to maintain key strengths in high-risk exposure refrain. In such situations, strategies such as efficiency, increase services and other items used. The aim of this strategy is that the exploitation of the opportunities available with indoor strive to improve internal weaknesses. The organization because of internal weaknesses can exploit this opportunity obtained. Therefore, strategies such as the use of new technologies, etc. be employed to eliminate loopholes will make good use of opportunities. Some recommendation have been suggested by authors in order to solve and decrease some problems. 1. Embedding bus and taxi stations and other vehicles around the site due to the growing population of the region, particularly for patients of the hospitals. 2. Planting trees and retaining walls around the site in order to reduce air pollution and noise pollution which are caused by highway and educational and residential centers. 3. Since educational and residential centers next to the medical center is not appropriate from passive defense prospect, educational and residential centers yard can be used in critical moments in order to accommodate relief camp and help people. 4. Using potentials of 22nd district of Tehran in critical moments such as: firefighting centers. 5. Noticing the potentials for regional economic growth due to population growth which are mentioned in official website of 22nd district of Tehran. 6. Locating suitable places for fuel and vital material (food, water, medicines) and critical equipment (emergency power). 7. Preventing construction of critical complexes such as (Military centers) near the medical center. Azizi M. (2005). Application of geographic information systems GIS to locate, analyze the spatial distribution of the network of health centers in the case of the Mahabad city. Thesis, University of Tabriz, Faculty of Humanities and Social Sciences. Faizollahi MJ. (2009). A model -based design for positioning units, hospital services and their performance. Journal of Martyr Beheshti University of Medical Sciences. 4: 198-191. Hosseini B. (2007). Passive defense requirements in architectural design of medical centers. The second module of training managers Technical University of Medical Sciences offices across the country. Journal of Civil Engineering and Urbanism. 2: 1-2. Mahboobi M. (2013). Locating and designing a comprehensive hospital in Tehran with passive defense approach. Islamic Azad university central Tehran branch. Science. 1: 5. Nakhaei J, Bagherzadeh A. (2015). Principles applied in compiling the research project. Jam Jahan Nama publishers. Science and Information Technology. 10: 1-16.